Ebony's Michael Arceneaux wonders when the genre's stars will stop pushing bigotry in the name of "American pride." 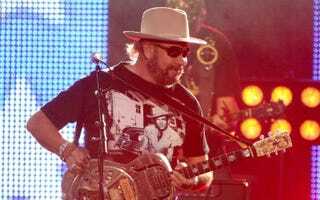 Hank Williams Jr. is defiantly dense. During a show at the Iowa State Fair earlier this month, the country music legend said to a crowd of 8500, "We've got a Muslim president who hates farming, hates the military, hates the US and we hate him!" It's been nearly a year since his now infamous appearance on Fox News' Fox and Friends in which he referred to President Obama as "Hitler," both Obama and Vice President Biden as "the enemy," and likened the two to "the Three Stooges." The comments led to ESPN dropping his musical opener from Monday Night Football, but rather than learning to think before he speaks, Williams has instead opted to scream louder than ever. Enter politically fallacious tracks like "Keep the Change," in which Williams croons: "I'll keep my freedom / I'll keep my guns / I'll keep my money / and my religion too … I will keep my Christian name and you all can keep the change." The irony of a hate monger worried about attacks on the Christianity he doesn't practice particularly well. Nevertheless, Williams told Rolling Stone in July that he's been rewarded handsomely for his Obama bashing. The country crocks of America undoubtedly appreciate the pandering, but that doesn't negate the hypocrisy of selective outrage. Read Michael Arceneaux's entire piece at Ebony.com.